" The tiny fish enjoy themselves in the sea "
I don't know if I have mentioned it ever but I'm from Turkey and I have family living there (e.g. my father :p). So I have been to Turkey in the summer break. Well as I just told my family lives in Istanbul but we (my dad and I) had planned to fulfill our free days in Cesme (a place near Izmir). My dad was going to travel with the car from Istanbul to Cesme and I had decided to join him with this journey of 5 hours. I took the plane from Amsterdam to Istanbul, however he had some business to do so I have stayed one night (2 days) in Istanbul and fulfilled my time with a visit to an aquarium near the office of my dad. I'm sorry for the low quality of the pictures but it is not allowed to use the flash in the aquarium. Normally, I'm a scared as hell for sea "animals", but I felt safe by the thick glass of the aquarium. And I have never heard of an aquarium which has collapsed, so there was no reason for me not to go or to panic. When we first entered the building there were some "little" aquariums attached on the sides of the wall. Well I don't know how to describe it properly but if you look at the first picture below this text you wil understand what I'm trying to explain. While walking further we discovered a whole sea world. We ended in a tunnel, well an aquarium tunnel it was. We could see the fishes swim above us. As you may can guess, one of my greatest fear are sharks. And of course there were also sharks in the giant aquarium. Although this time it was really cool, spectacular! We caught him on some pictures. Which you can find below. There was also a giant lobster. I have worked in a Japanese restaurant where they were serving fresh lobsters. However this one had nothing to do with the lobsters I knew. This one was big, double the size of the ''well known red lobsters'' and it was blue. There were also exotic fishes.... And of course Nemo was also there!! yeah, the friend of all of us. Well not only Nemo was interesting, the other fishes were also interesting. The most funny happening was that they were posing for the picture. I only missed the smile on their face though there poses were not that bad. When we walked out the aquarium we found the following pieces of art made of chocolate. 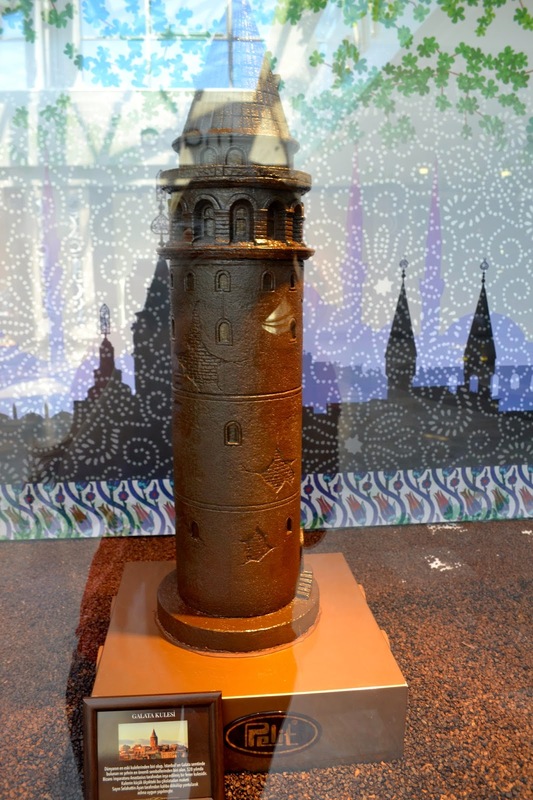 The pieces consisted of the Sultan Ahmed mosque and the Kiz Kulesi (which means Ladies Tower) which both are touristic attractions of my home city. Btw I don't know if you have ever heard of the chocolate brand Pelit, however you should try it. Well this was my story for now. The summer break is just behind us, that means that I have enough to write about. So see you soon.